By presenting the New Testament books in the order they were written, bestselling Bible scholar Marcus Borg reveals how spiritually and politically radical the early Jesus movement began and how it slowly became domesticated. 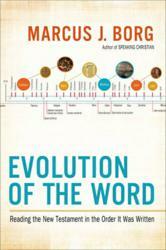 Evolution of the Word is an incredible value: not only are readers getting a deeply insightful new book from the author of Speaking Christian and Jesus, but also the full-text of the New Testament—and one of the only Bibles organized in chronological order and including explanatory annotations that give readers a more informed understanding of the Scripture that is so close to their hearts and lives. By re-ordering the New Testament books in the sequence of when they were written, Borg provides a wonderful tutorial of how the core ideas of Christianity took shape and developed over time. Marcus Borg, bestselling author and Jesus scholar, now offers an informative new way to look at and read the bible itself in EVOLUTION OF THE WORD (HarperOne; June 2012; hardcover; $29.99; 608 pages). Anyone who has read the New Testament knows that it begins with the Gospel of Matthew, but how many people know it was actually one of the later books to be written—it was not even the first Gospel! By re-ordering the New Testament books in the sequence of when they were written, Borg provides a wonderful tutorial of how the core ideas of Christianity took shape and developed over time. With introductions and sidebars to each of the books of the Bible, as well the oral history of what Jesus said before it was written down, Borg reveals how what began as a radical Jewish faith transformed itself into Christianity. From Paul’s authentic letters and the first dramatic telling of Jesus’s story in Mark, we see how an anti-imperial movement started a religious revolution. But we also witness how the next generation of writers slowly began to erode the movement’s radicalism. Marcus J. Borg is Hundere Distinguished Professor of Religion and Culture, Emeritus at Oregon State University and author of the bestselling Meeting Jesus Again for the First Time, The Heart of Christianity, Reading the Bible Again for the First Time, The God We Never Knew, Jesus, the novel Putting Away Childish Things, and most recently, Speaking Christian.